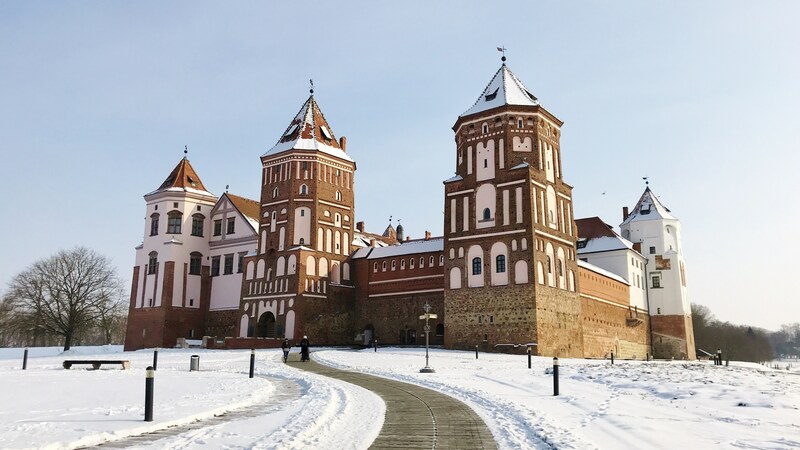 The Eastern European country of Belarus is perhaps one of Europe’s less well known countries and a bit off the beaten track as regards tourism. That is a pity because it certainly has much to offer the visitor – especially if, like me, you are interested in history. There are several UNESCO World Heritage Sites and for nature lovers over 40 percent of the country is forested. Belarus lies between Latvia, Lithuania, Poland, Russia and Ukraine. With some 10 million inhabitants its population is similar in size to that of Belgium, but the country itself is nearly seven times as big. In the past, its name was often translated into English as White Russia. When I travelled there in late Winter, ‘White Russia’ certainly lived up to its name: snow lay everywhere! And it was cold! From 1385-1795, much or all of what is today Belarus was part of a vast union of the Kingdom of Poland and the Grand Duchy of Lithuania that stretched from the Baltic Sea to the Black Sea. At its peak in the early 17th century, this Commonwealth – known as the Rzeczpospolita – was the largest country in Europe, covering one million square kilometres. Modern-day Belarus lies in the part of the Rzeczpospolita that was the Grand Duchy of Lithuania. Unsurprisingly, its history overlaps with that of its neighbours. And, like anywhere, it is impossible to understand the modern-day country and its people without knowing something about its past. The powerful Radziwiłł family from Lithuania, who later rose to prominence in Poland and Prussia, also played an important role in Belarus. They owned entire towns and built several castles there. In total, they had 23 palaces, 426 towns, over 2000 estates and more than 10,000 villages, spread across vast lands. Two of the family’s former palaces in Belarus – at Mir and Nesvizh – are today UNESCO World Heritage Sites. Both have been carefully restored after many years of neglect during Soviet times. Belarussian cities like the capital Minsk, and Brest and Grodno were on the busy trade routes between the Baltic and Black Seas, the latter providing access to Asia Minor. What is today Belarus produced goods like amber, furs and beeswax. In the 18th century, the Polish-Lithuanian Commonwealth became politically weak. In three stages, its neighbours Austria, Prussia and Russia divided its territory between themselves like a cake until it ceased to exist as an independent state. The territory of modern-day Belarus became part of Imperial Russia. In the 19th century Tsars Nicholas I and Alexander III introduced a policy of Russification, banning the use of the Belarussian language in schools, and replacing Latin script with Cyrillic and Catholicism with Orthodoxy. But, like elsewhere in Europe, in the 19th century Belarus witnessed the growth of nationalism and a sense of national identity. Unfortunately, being at the crossroads of trade routes and being relatively flat meant that over the centuries Belarus has often found itself a theatre of war or on the transit routes of various armies. Its people have suffered as a result; history casts a long shadow over Belarus. In the 18th century Russia and Sweden (then a major power) wrought havoc as they battled for control. When Napoleon marched on Moscow he led his army through Belarus, decimating Minsk on the way. 140 years later, Hitler’s troops invaded the Soviet Union: Belarus was again one of the main routes to Moscow. The Stalin Line – a line of defences from the Baltic to the Black Sea similar to France’s Maginot Line in the west and equally ineffective – crumbled under the German advance. Today, a part of it north of the capital Minsk is an open air military museum. The country suffered heavily during World War II, known in Belarus as the Great Patriotic War. No less than a quarter of its population – 2.2 million people – perished, including 380,000 who were deported as slave labour, never to return. More than 200 cities and townships and over 9,200 villages were destroyed. All of Belarus was in the Pale of Settlement, the territory Catherine the Great of Russia in 1791 declared as the part of the Russian Empire where Jews were allowed to live. Following the Revolution in 1917 the restrictions on Jews living elsewhere in what became the Soviet Union were lifted but, of course, many people stayed in their long-established communities. So, on the eve of War II Belarus had a large Jewish population. During the war, the invading German forces deported many Belarussian Jews to death camps, such as Auschwitz. Those who could, fled. Some 100,000 Jews were imprisoned in the Minsk Ghetto. It is said that the inhabitants of over 600 villages were burnt alive by the SS as punishment against partisans. In one such village, Khatyn, the entire population of 149 was herded into a barn, which was then set on fire. Those who tried to escape the flames were shot. Two boys and one man, Joseph Kaminsky, survived the horror. Regaining consciousness late at night, Kaminsky returned to the village where he found his injured son among the dead. He tended to his son’s gunshot wound and burns, but the child died in his arms. Today, the site where Khatyn once stood is a sombre memorial to those perished. The statue of The Unconquered Man represents Kaminsky and his son. Although both their country’s history and its winter are harsh, the Belarussians I met were cheerful and friendly. Temperatures were cold, but the welcome was warm. While I was there, I saw people of all ages braving the freezing weather to attend a folk festival in the capital Minsk. The snow was falling, but – as you can see from the movie clip – the crowd still danced spontaneously to various groups dressed in traditional costume and singing folk songs. Although among Europe’s less known countries, Belarus is certainly worth a visit. It exceeded my expectations! I will be posting a separate article and photos about the Belarussian capital Minsk shortly!